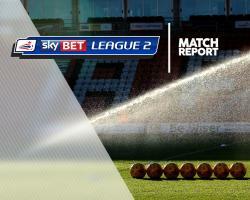 Cambridge piled further misery on Sky Bet League Two bottom side Leyton Orient with a 3-0 victory. Orient are now 10 points adrift of safety with only five games remaining after goals from Luke Berry, Liam O'Neil and George Maris lifted Cambridge to within two points of the play-off spots. Fielding a side with only three players over the age of 20, the O's held out for 31 minutes before going behind, when Berry nodded his 20th goal of the campaign from midfield following Harrison Dunk's cross. The visitors nearly equalised eight minutes before half-time when Will Norris made a fine save to claw Rowan Liburd's header wide, before the U's doubled their advantage four minutes later. Maris produced a pinpoint free-kick which was flicked across Sargeant by O'Neil, who netted his first Cambridge goal. Dunk nearly added a third early in the second half with a header which hit the post but the goal did arrive on 53 minutes when Maris fired home at the end of a goalmouth scramble.